Christians will often tell you that God speaks to them through the Bible and there are times when a familiar passage has brought new meaning to them at a specific time. Even though they have read it before, for some reason, one day, it has new meaning and the words leap off the page. Every believer has had this happen to them at some time or another. A recent example for me was the following verse from Mark 10. I understood this to mean that, while men are limited, God is not. 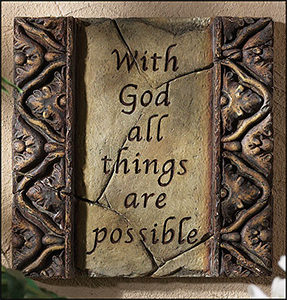 When we are unable, God is able. He holds the world in His hands and He can do anything he wants when he wants. This is similar to another passage in Jeremiah. This means that God’s grace working in us can empower us to do what we would be incapable to do without Him. 2 Cor 4:7 describes us as ordinary jars of clay jars with an extraordinary treasure inside. We can go beyond our natural strengths because God is working in us. Bible history is filled with examples of those who were weak in themselves, but when God got hold of them, they became fearless and capable: Paul, Moses, Peter, Gideon, Samson, David and Solomon are just a few. I have also found that God won’t move on our behalf until we ask Him in. He will let us wear ourselves out until we get to the point where we are at the end of ourselves. In my experience it’s better for me if I admit that early on and ask for God to help me before I become unstuck! The power available to the greats of the Bible is available for us if we ask Him, but we need to ask Him.